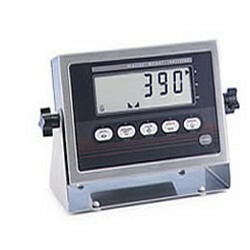 The compact size of this highly functional weight indicator is a plus for crowded industrial areas. The IQplus 390-DC with standard five-key operation for easy configuration and calibration. Operate on either battery or AC power and provide the flexibility of a counting mode. The IQ plus 390-DC digital weight indicator takes portability to a whole new level. Running on C-cell alkaline batteries, this handy indicator allows operation in practically any location. This indicator tops its rivals in ease of use and performance. It features a battery life in excess of 300 hours, and a unique configurable standby mode that conserves battery power. The optional livestock weighing program allows accurate results regardless of animal movement. The program operates easily by accumulating weight readings for a defined sample period. The weight is then divided by the number of readings to obtain an average weight. This value is displayed on the 390-DC for a defined period. The indicator then returns to normal weighing mode.